User interface researchers at the University of Montreal are hard at work on redeveloping the humble mouse pointer for a three-dimensional world. They're developing techniques that'll allow users to more easily interact with 3D objects. "Our new technology challenges the notion of what a cursor is and does," said lead researcher Tomás Dorta. "The cursor becomes a drawing and controlling plane. The techniques we're unveiling today involves using a tablet to control the cursor, but as it does not necessarily rely on external tracking of the user's movements, eventually other devices could be used, such as smartphones or watches." Dorta compares his 3D cursor to a butterfly net - you can sweep it through space to select objects, and then use gestures to manipulate those objects. 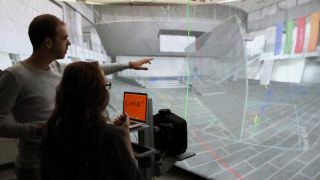 It's part of a full-scale immersive 3D environment that the team built using a spherical fabric screen and a custom-made projection system. Initially, that system is being used for interior design - Dorta gave the example of a living room where designers could test different furniture options and work on detailing. The technical specifications were detailed in a paper that the team presented at the SIGGRAPH 2015 conference in Los Angeles. "Beyond its utility for sketching, we believe the 3D cursor has applications in a wide range of fields, such as architectural design, medical imaging and of course computer games," said Dorta. "This isn't a gimmicky rebirth of the cursor, it's about rethinking how humans interact with computers as part of the creative process."